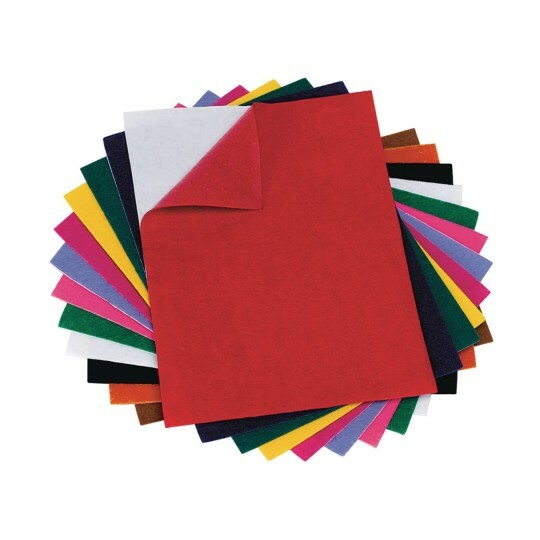 Sheets measure 9" x 12"
Self-stick felt sheets can be easily cut in any shape with scissors. They're also an alternative to magnets, tacks, sticky putty and tape. 9" x 12" sheets. Assorted colors. I do a lot of felt board stories for my Library Storytime adding small pieces to a project has always been a problem especially with a glue gun. The convenience of just cutting the piece and pressing it on is wonderful. They stay stuck even with the hand-on attention of pre-schoolers. I really like using this product! Easy to use and very good quality! I used this felt for a variety of projects at a girl scout camp and it was great - use to use stayed together and a nice selection of colors.